Our Vancouver neighbourhood is in transition. I may venture to say that ALL Vancouver neighbourhoods are in transition. That is because the land beneath these 50, 60, 70-year old homes is worth more than the homes themselves. So a developer can buy an old house for $700K, tear it down (and if you got it at that bargain price, the house must be in tear-down condition), and put up a monster home for less than $250 – $350K. Then sell it for $1.299 million. is currently available at that price. Check it out. Of course it has two suites for rental, so we’re attaining some kind of density. 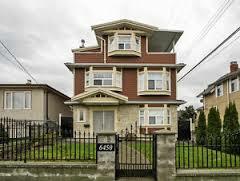 But the house to the side indicates the size of house it replaced in its East Van neighbourhood, quite a difference. Right now the house in our neck of the woods that we affectionately dubbed “the crack house” is currently undergoing such a transformation. Workers swarm over it every day (even Easter Sunday) as the new structure rises before our eyes. But what interests us is the large foundation they just poured on the lane. It could turn out to be for a garage, which would add another $50K to the value of the finished house. Or it could very well be for a laneway home, which would add another $350K. I’m thinking it will be a laneway. And it will be just one of many in our area. Most are going up behind new builds, such as the one pictured above. But many are being tucked behind existing homes. We’ve just got the news that our neighbours are being evicted from their rental basement suite after the sale of the house. For a few heart-stopping moments we worried that the new owners were going to tear down the mid-century building, but it turns out they are planning a house-wide reno on the two suites therein, and hope to build a laneway on the property. I remember chatting with the former home owners while our laneway was being built, and they were quite interested. But one thing definitely will stand in their way. The house has a HUGE deck off the back. Much larger than would be allowed if it had been built with a permit. To build the laneway and still keep the needed 16 foot distance between the two homes, the deck must come down. That might be a step they are willing to take. If the reno is done with permits the deck may have to come down anyway. Whatever may come, laneway homes are no longer a novelty in this neighbourhood, or anywhere in this city. They are a viable partial solution to the shortage that is driving up the price of housing here and elsewhere. Laneway homes are popular in Toronto, and have recently been allowed in Saskatoon and may soon hit Regina. Could this be the Canadian way to achieve greater density?